Transformer is a passive electrical device for transmission of power from one AC system to another. We manufacture and supply Transformers suitable for low voltage (LV), medium voltage (MV) or high voltage (HV) applications. We provide exclusive range of transformers such as Control Transformer, Three Phase Transformer and Electric Control Transformer. With the quality as our prime importance, we have earned the trust from our esteemed clients by making use of advanced technology to meet international standards. The product is appreciated for its durability, comfort, reliability and specific features like optimum performance, latest technology and compact design. 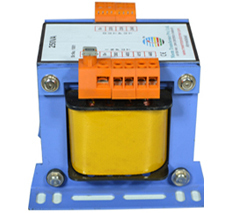 Packed with latest features, our control transformers are of world beating standards.